Sgt. 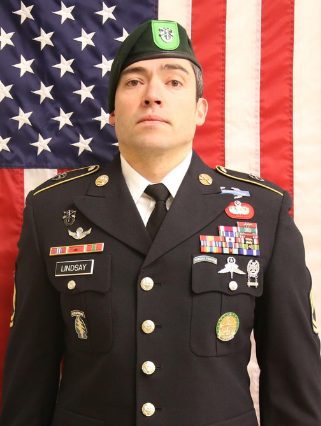 1st Class Will Lindsay, 33, of Cortez, Colorado, died March 22, 2019, in Kunduz, Afghanistan, as a result of wounds sustained while engaged in combat operations as part of the Operation Freedom’s Sentinel. Lindsay was assigned to 10th Special Forces Group (Airborne), Fort Carson, Colorado. Lindsay was born on Aug. 26, 1985, in Cortez, Colorado. He enlisted in the Army on July 7, 2004. Following the completion of One Station Unit Training and Basic Airborne School at Fort Benning, Georgia, Lindsey completed the Special Forces Qualification Course and was assigned to 2nd Bn., 10th SFG (A) in July 2006. Lindsay’s military education includes the Basic and Advanced Airborne Schools, Basic and Advanced Military Free Fall Courses, Special Forces Qualification Course, Special Operations Target Interdiction Course, Advanced Special Operation Techniques Level II, Special Forces Senior Leader Course, Special Forces Intelligence Sergeant Course, and Army Special Operations Forces Master Leader Course. Lindsay’s awards and decorations include the Bronze Star Medal (4 OLC), Purple Heart Medal, Meritorious Service Medal (1 OLC), Valorous Unit Award, Meritorious Unit Award (1 OLC), Army Superior Unit Award, Army Good Conduct Medal (3 OLC), National Defense Service Medal, Global War on Terrorism Service Medal, NCO Professional Development Ribbon (3 OLC), Army Service Ribbon, Overseas Service Ribbon (1 OLC), NATO Medal, Special Forces Tab, Combat Infantryman Badge, Military Free Fall Jumpmaster Badge, Master Parachutist Badge, Chilean Airborne Wings and Senior Instructor Badge. He is survived by his wife and four daughters.